Hey all, I had this for Christmas dinner. What did you have? Christmas always flies by in the blink of an eye, doesn’t it? I love the holiday season and am always a little blue when it’s over, but thankfully, there’s still New Year’s to look forward to (also, New Year’s eve is Jesse’s birthday!). Our Christmas was very low key because it was just the two of us at home, but still eventful in my book. I got up just before 7:30 and made homemade turkey breakfast sausage (recipe to come!) and granola, all in the glow of the Christmas lights. It was dark, peaceful and magical with the glow of the lights. I also took it upon myself to play Santa and sneak some goodies into Jesse’s stocking. We agreed that our trip was our Christmas present to each other, so didn’t buy any actual gifts to open, but I couldn’t stand the thought of an empty stocking. I filled his stocking with a dark chocolate caramel sea salt bar, a locally made candy bar of dark chocolate, honey, hazelnuts and nougat, and some locally made creme de Earl Grey loose-leaf tea (this stuff is amazing). Jesse was pleasantly surprised to find a stocking filled with goodies. 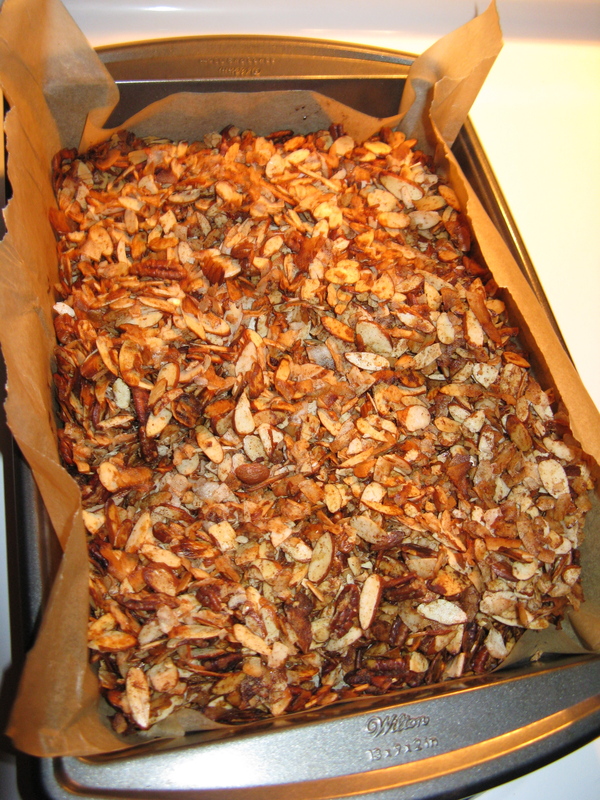 Grain-free granola, fresh out of the oven. I added a little pecans too since I had a package open. Homemade turkey breakfast patties. 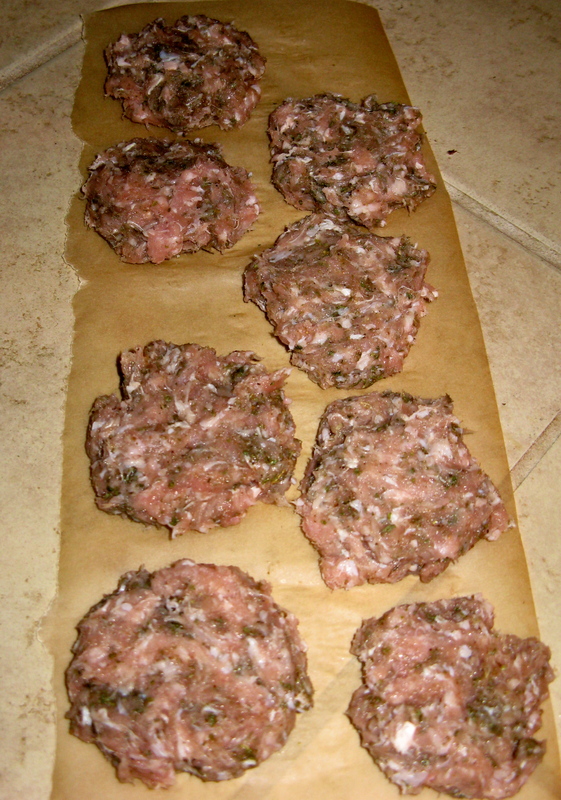 For our scramble, I took four of the patties and broke them up into the pan. Once cooked, I added the eggs and some frozen kale. 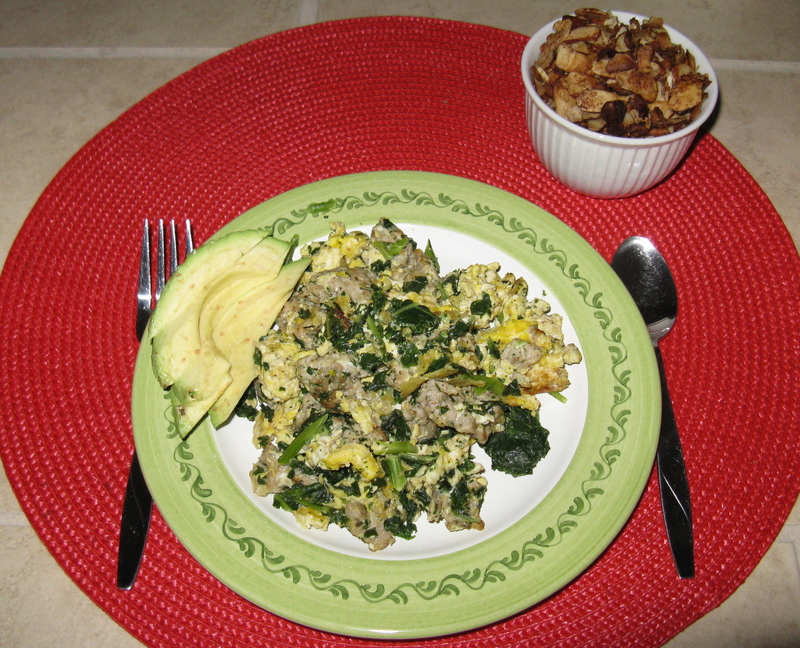 Scramble with pastured eggs and homemade breakfast sausage, avocado, and a small dish of homemade yogurt with fresh granola. 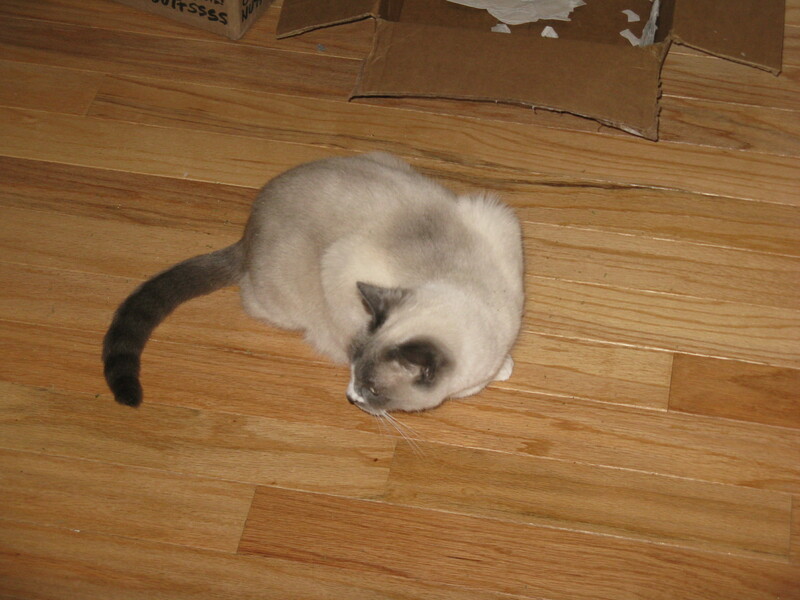 I woke Jesse up when breakfast was ready, around 8:15 or 8:30. He walked out to a place setting with a sausage and kale scramble and avocado, homemade 24-hour yogurt with fresh granola, and a glass of grapefruit juice. Jesse always has a glass of grapefruit juice first thing in the morning. It’s his ritual. After we ate, we both sipped on some heated cold-brew coffee (mine bulletproof-style with grass-fed butter and coconut oil) and then Skyped with my parents and sister for nearly an hour! We had a lot to chat about, especially with the recent news of our engagement. Everyone is pretty darn excited! We gave the cats some cat nip to celebrate Christmas day. Dutch doesn’t care much about it, but Mila loves it. You should have seen her rubbing all around in it and then going crazy and grabbing at her tail. The rest of the day consisted of discussing wedding plans, making lists, looking at invitations online, cooking and eating dinner, and watching Love Actually. Christmas is much different when it’s just the two of us versus when we’re back in Michigan with family. This year was especially different because our recent engagement was very much on my mind, and that’s why I took it upon myself to start jotting down ideas. I had to mash my cauliflower old school style. There’s something wrong with the motor in my food processor, so the blade doesn’t spin properly. It’s probably my fault because it’s just a small, 4-cup processor that I often over-pack. For things like mashed cauliflower, I have to work in batches. 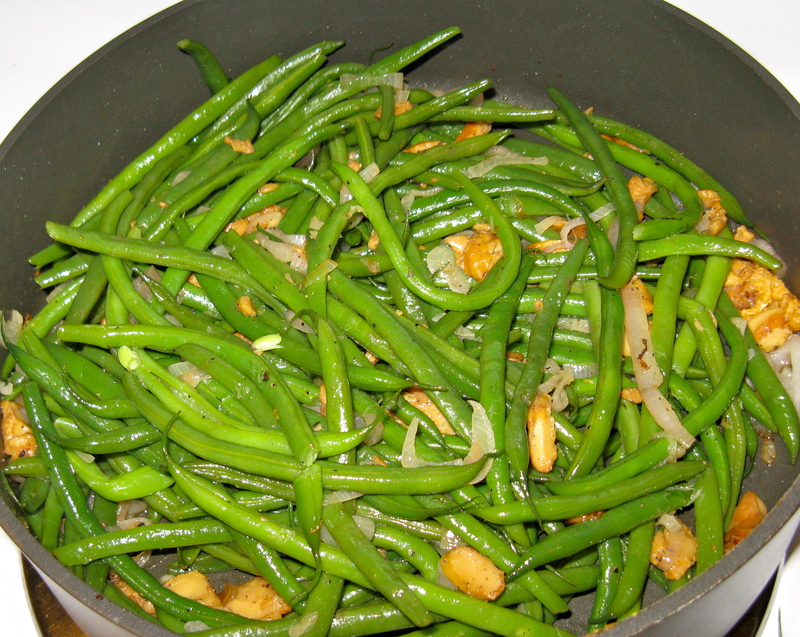 Green beans with sauteed chanterelles and shallots. We also had this for Thanksgiving. Jesse looks like he’s praying here, but he’s actually not. He was sitting there giggling and pretending he was. Really, he just wanted me to stop taking pictures, so he could eat. 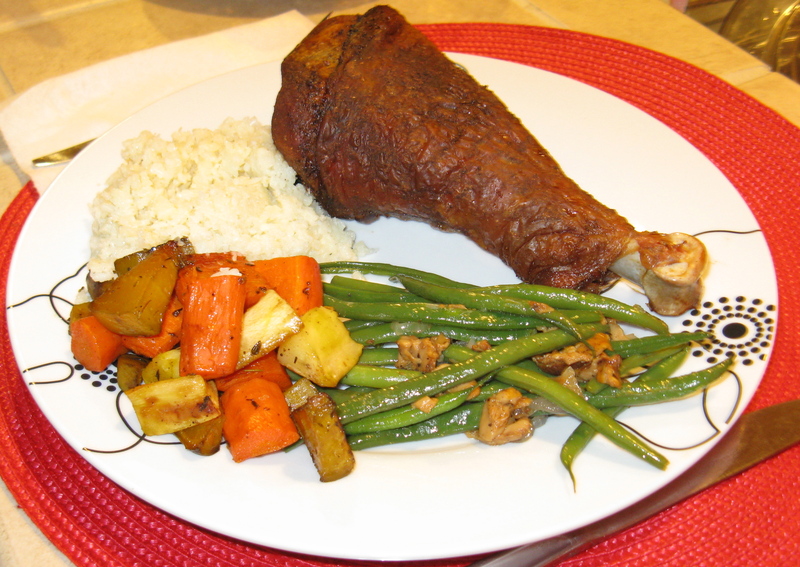 For dinner, we had turkey legs, root veggies roasted with coconut oil and thyme, green beans with sauteed chanterelles and shallots, and mashed cauliflower. For dessert, homemade dark chocolate ice cream. My dinner plate. The turkey legs were so big that we each only ate about half. Okay, so it’s not the most flattering picture, but I thought it was kinda funny, actually. 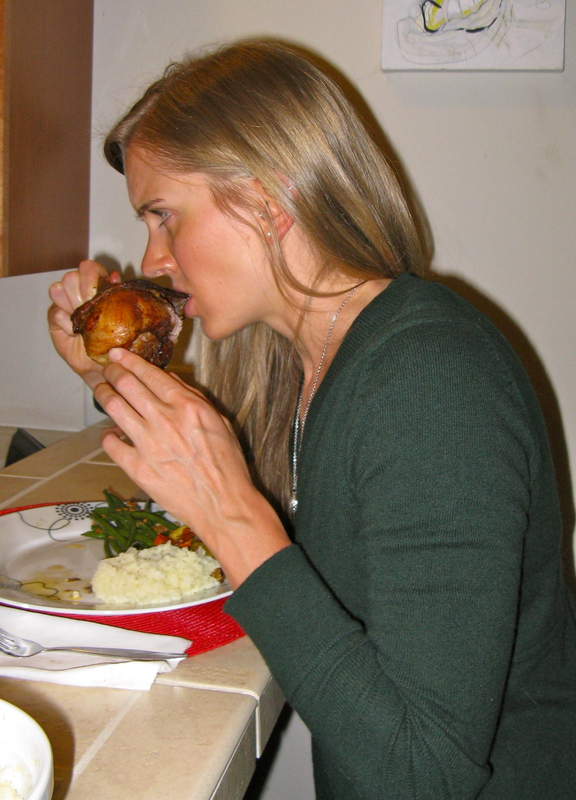 I was a couple bites into my turkey leg, trying to tear the delicious crispy skin with my teeth. I am hard at work, as you can see. 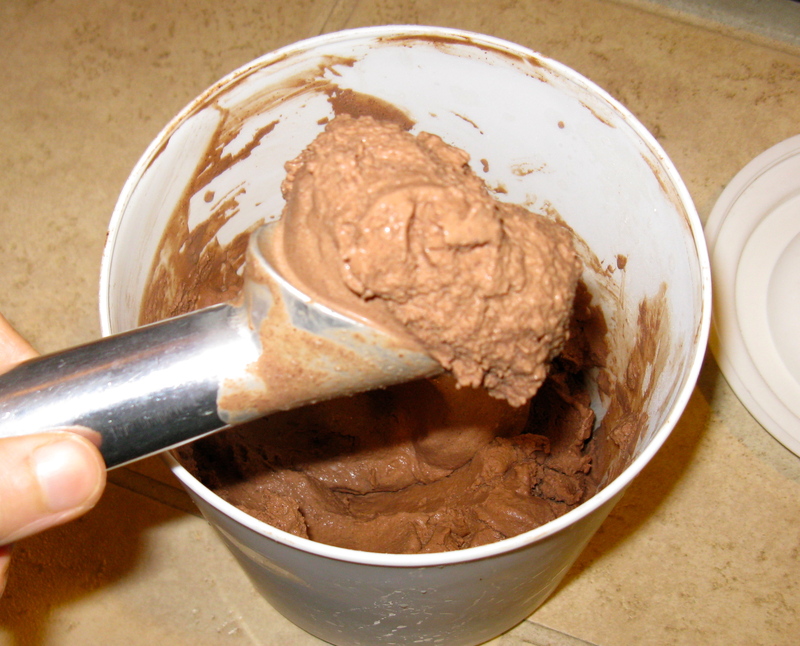 Homemade dark chocolate ice cream for dessert. It was good, but needs some tweaking. Great pics and story, Alisa! Dad. I know, right?! It’s the first time he’s left a comment before. I think the turkey legs influenced him to do so. 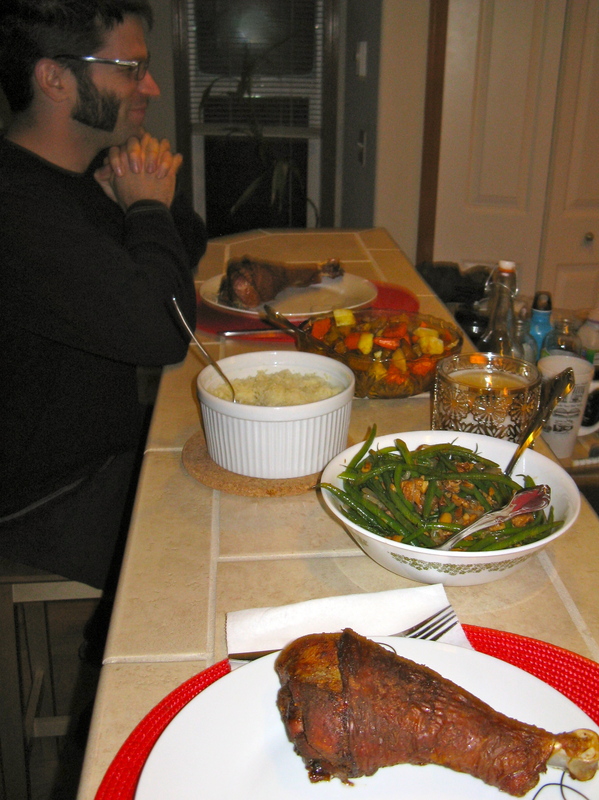 When I Skyped with him that day he kept talking about how good our recipe sounded. I’m a goober in the kitchen. Can you explain how to prepare those veggies? Just for 1-2 servings? I have NO idea what to buy, how to cut, how to coat them and properly cooking time, etc. 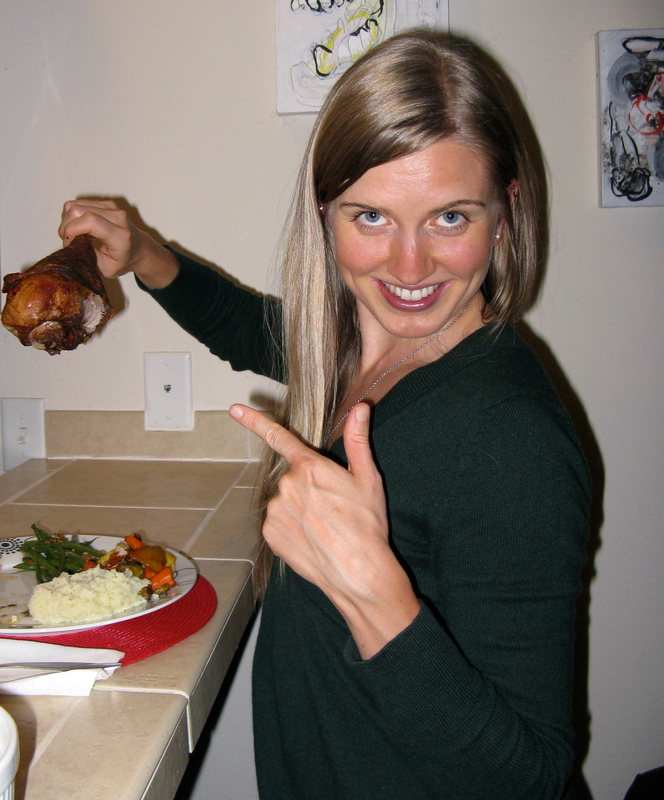 I’d love to eat turkey skin but can only get the grain-fed stuff…so “try” to avoid it. “Try”. Also, recipe for mashed cauliflower? Again, I’ve no idea. Do you cook on your own, Rachel? 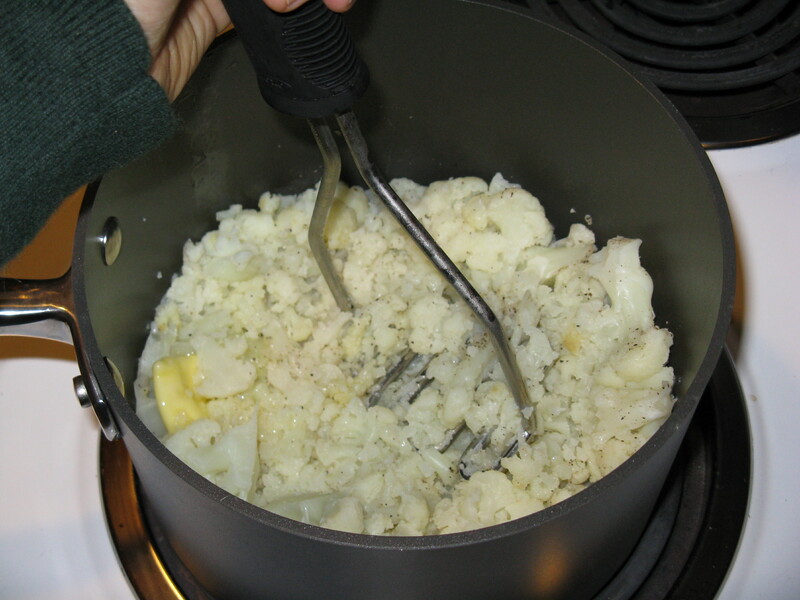 There’s really not much to explain … for the cauliflower, buy a small head, wash and chop it up, steam for 12-15 or until fork tender, then mash with a hand masher with desired amount of butter and salt and pepper. You can also throw it all in the food processor together. For the root veggies, chop and peel carrots and beets. Cut to desired size pieces. Pour some melted coconut oil over top (for 1-2 servings, which is maybe 1 beet and up to 2 carrots, use 1-2 tsp oil). Roast at 375 for 30-45 minutes. It’s hard to estimate exactly 1-2 servings with veggies, but leftovers are great! Veggies are nice to have leftovers of for things like scrambles too. I recommend taking advantage of YouTube and Google for chopping demos and these sort of basics. It will help you out big time in the kitchen if you don’t know how to do these things. All of this food looks so delicious and you look adorable in the pictures! That leg is like the size of your head ha! I can’t wait to get home and take over the kitchen again! Ha, thanks Megan! I admit, it feels really good to be back in the kitchen after my trip. Haha, I could have, but would’ve been really full and not had room for homemade coconut milk ice cream. The legs were about 2.5 lb each and Jesse couldn’t even eat all his at once. I’m not sure I know of Gremlins being a Christmas movie either 😉 Sounds like you had a great day though, and brisket … yum!